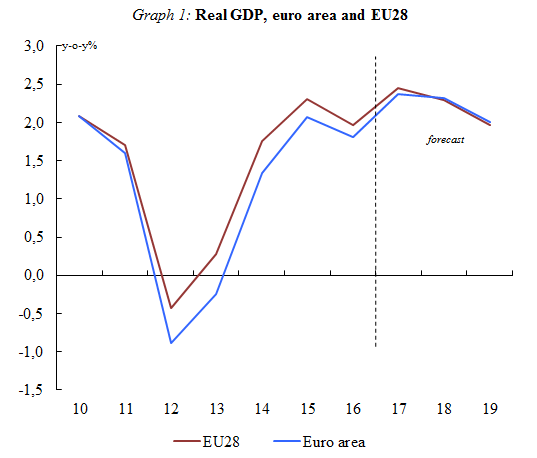 This robust performance is set to continue in 2018 and 2019 with growth of 2.3% and 2.0% respectively in both the euro area and EU. The 2.4% GDP growth now estimated for 2017 is above November's Autumn Economic Forecast projections of 2.2% for the euro area and 2.3% for the EU. The growth forecasts for 2018 and 2019 have also been raised since November for both the euro area and EU economies: from 2.1% to 2.3% for this year and from 1.9% to 2.0% for 2019. This is a result of both stronger cyclical momentum in Europe, where labour markets continue to improve and economic sentiment is particularly high, and a stronger than expected pick-up in global economic activity and trade. Strong demand, high capacity utilisation and supportive financing conditions are set to favour investment over the forecast horizon. Core inflation, which excludes volatile energy and unprocessed food prices, is expected to stay subdued as labour market slack recedes only slowly and wage pressures remain contained. Headline inflation will continue to reflect the significant influence of energy prices and is forecast to rise modestly. Inflation in the euro area reached 1.5% in 2017. It is forecast to remain at 1.5% in 2018 and to increase to 1.6% in 2019. Risks to this growth forecast remain broadly balanced. Economic growth could exceed expectations in the short term as indicated by the high level of sentiment. In the medium term, high global asset prices could be vulnerable to a re-assessment of risks and fundamentals. Downside risks related to the uncertain outcome of the Brexit negotiations remain, as do those associated with geopolitical tensions and a shift towards more inward looking and protectionist policies. This forecast is based on a set of technical assumptions concerning exchange rates, interest rates and commodity prices with a cut-off date of 26 January 2018. For all other incoming data, this forecast takes into consideration information up until 30 January. From this year, the European Commission will revert to publishing two comprehensive forecasts (spring and autumn) and two interim forecasts (winter and summer) each year, instead of the three comprehensive forecasts in winter, spring and autumn that it has produced each year since 2012. 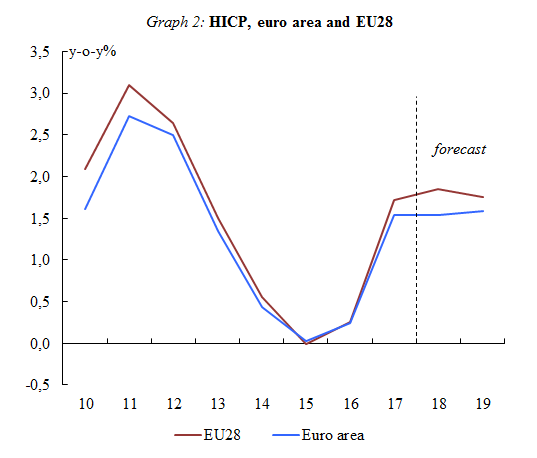 The interim forecasts will cover annual and quarterly GDP and inflation for the current year and following years for all Member States and the euro area, as well as EU aggregates. This change is a return to the Commission's previous pattern of forecasts and brings the Commission's forecast schedule back into line with those of other institutions (e.g. the European Central Bank, International Monetary Fund, Organisation for Economic Co-operation and Development).